If you’re like me, you have a blog and a Twitter, Facebook, StumbleUpon, YouTube and Flickr account, but when someone starts to talk about CMS, metadata, Squidoo lenses, or the semantic web, you quickly tune out. We’re all aware of how vital the social web is for reaching new audiences, but we’re unsure of which tools are best suited to our online objectives, or which tools are the best investment of our time. In The Social Media Survival Guide, Deltina Hay walks you through the basics of using the most popular social media tools and helps you to devise your own strategy to meet your online objectives and hopefully save you time. An added bonus, this book comes with a very useful CD to help you prepare your own social media strategy plan so that you can add the tools that best suit your needs and expand your social media presence. The CD worksheets and forms are also indispensable for maintaining records and keeping your online information consistent. The Social Media Survival Guide is intended for "do-it-yourselfers, resourceful business owners, motivated authors, innovative publishers, and directors of IT or marketing departments.” However, I could easily see some young self-starters using this book and CD to carve out a niche for themselves among older, more technically-limited business owners. The Social Media Survival Guide is divided into fifteen chapters and appendices for code lovers with a burning desire to install WordPress or create an RSS Feed or widget from scratch. The book begins with your social media strategy plan, which you will repeatedly return to, and it offers seven sample strategy plans, which are especially helpful if your own profile mirrors one of the samples. The book can be divided into three different parts. The first applies to the general public and addresses tags, or key terms; RSS feeds and blogs; building a WordPress site; and Pod, Vid, and Webcasting. The entire book is more useful if you have a WordPress blog or website because the subsequent chapters refer to how this Content Management System (CMS) can easily accommodate a large range of social media tools. The second part addresses Social Networking (Facebook) and Micro-blogging (Twitter), Social Bookmarking (Delicious) and Crowd-Sourcing (Digg), Media Communities (image-, video- and document-sharing) and Widgets. Although I thought I knew everything in this section, I still gleaned some useful information about some features on the ever-changing Facebook, and the section on document-sharing is definitely worth a look, particularly if you work in publishing. However, the author should have focused more on StumbleUpon rather than Delicious, whose future is uncertain. The last section would be most useful to business people, but it’s still worth the read to learn about the other available tools. This section covers the Social Media News Room, other Social Media Tools (geo-tagging, event tools, etc. ), Integration and Streamlining Tools, the Future of Social Media (Web 3.0), and How to Measure Success (Analytics, Search Optimization, etc). 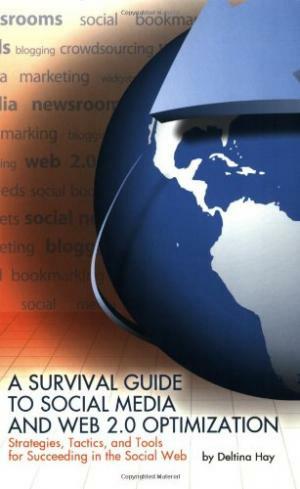 Deltina Hay uses easy-to-follow language throughout The Social Media Survival Guide. The chapters follow a logical order, and the book itself will serve as a great reference guide if only for eighteen months; by then the social media landscape will transform itself yet again. After reading this book, which was initially overwhelming, I can honestly say that I learned a lot. I’ve also seen the limitations of Blogger as a CMS and have already made plans to change my blog over to WordPress. However, I wish that the publisher had fleshed out the Vid and Webcasting section and provided a script, as was done for Podcasting. In the end, I found the book at 450 pages was too long for anyone who was not taking a course in social media at a college or university. Although the author is thorough, I believe that the publisher might be better off to break this text into three separate books to make it more palatable to the social media enthusiast. Otherwise, I fear that this textbook might stay on a to-do list until it’s old news.